Create a timeless, cozy look in your bedroom with these poly-cotton, machine washable poplin pillow shams. The ruffling detail adds a decorative layer to your elegant bedding set. The unique design will tightly encase your pillows to create a plush look and feel. Made of a soft cotton blend, the ruffles create a warm and inviting look in your romantic bedroom. Disappointed. The quality is excellent, they are well made and worth the money. However, they were advertised as king size. They are not - they fit only a standard size pillow. They are about 10 inches short of being king size. I love these shams! They are of excellent quality and exactly like the shams I previously purchased from a well known department store for twice the money! It is very difficult to find solid black shams, and these were just what I was looking for! The ruffling on the edges add just the perfect touch to the beauty of these shams .Shipping was super-fast and arrived well packaged! I recommend these shams for anyone looking for superb quality and beauty without spending a fortune! The cotton poplin ruffle pillow shams are beautifully made! It really dresses up your bed only cons is that it could be a little softer but it washes really great! And being cotton will get softer- overall happy with my purchase! Makes my bedroom complete, loving my ruffled shams with my ruffled drapes. Nice white pillow shams that are sturdy cotton and looks really nice on the bed with the bed skirt and spread ! Highly recommend them ! Needed a little warm iron after washing in cold water. These pillow shams are beautiful. A great addition to my bedroom. I bought the white. They fit the pillows nice and snug, and the material and ruffle has a very nice weight to it. You get two for $** so you can't beat that price! Thanks Overstock!! I bought these shams in white because I was trying to create a pottery bran looking bed. I must say these shams are great. The fabric is a good quality. They don't feel cheap at all. Because I'm just using them for decorative purposes they do the job well. I am pleased with them. King size shams are difficult to find except as part of a "set." These shams are exactly what I was looking for, in the fall color that I needed, and the price was perfect. 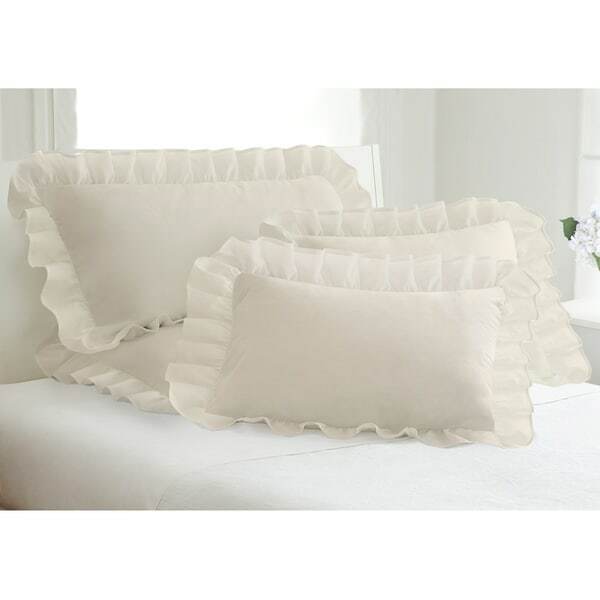 I like these ruffled pillowcases, they are made well and fit my standard pillows perfectly. The fabric is nice, the white color is beautiful and contrasts my bedspreads nicely. They come 2 per pack and are good value for the price, especially on sale. material a little flimsy but worth the price...get what you pay for in this case. These are good quality, and have held up very well after several washings. Because they are poplin, they won't be as soft as some would like, but that is inherent in the product. Very pretty. Large enough to allow pillow to be put in easily, but not too big. Have to iron mine to look nice. Fabric could have been softer, but it's firm enough to look "crisp". Were perfect for my antique bed. Perfect! Washes well. Looks nice on the bed. I am very happy with these ruffled pillow shams. They are pretty, and looked very nice after I washed them -- in the washer and the dryer, and they were good! These pillow shams look so nice on my bed. The fabric is sturdy and sewn well. I've washed them twice since I purchased them and they come out of the dryer almost wrinkle free. I give them a quick press and they stay looking fresh and wrinkle-free while on the bed. I love them and would purchase them again. I wish they would make them in more colors because I would buy more. I love these pillow shams and they were such a great price too! Looks ok, has no problems with item. "Why do you show all the colors and then only have them in white and ivory?" Unfortunately, we are currently out of stock with the colors shown. We hope to restock additional colors if they become available again. Please check back with us periodically. O'stock doesn't edit their merchandise imaging that vigorously. "I've had these shams for several years and they are awesome-is there a coordinating duvet cover?" Hello nycdecor, I'm sorry it only looks like we currently carry the shams. Have a great day! "Can anybody tell me what kind of enclosure these shams have? Envelope or zipper? Thanks!"